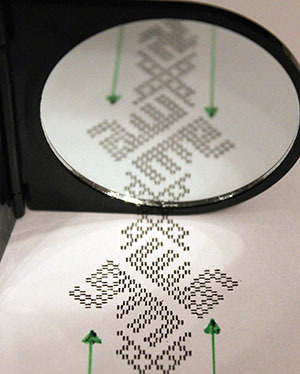 What was previously thought to be typical Viking Age, silver patterns on woven silk bands, could in fact be geometric Kufic characters. As part of an exhibition at the Enköping Museum, ongoing research is presented where a textile archaeological analysis suggests that both Allah and Ali are invoked in the pattern of the bands. The Arabic characters appear on woven bands of silk in burial costumes found in Viking Age boatgraves, as well as in the chamber graves clothing of central Viking Age sites such as Birka in Swedish Mälardalen. patterns found in Birka, Sweden. “One exciting detail is that the word ‘Allah’ is depicted in mirror image,” says Annika Larsson, researcher in textile archaeology at the Department of Archaeology and Ancient History at Uppsala University. 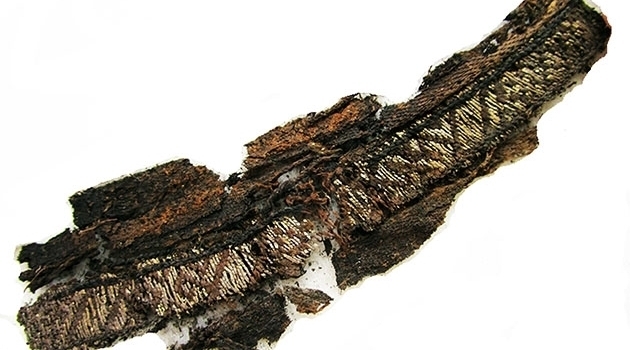 It was while working to recreate textile patterns for the Viking Couture exhibit at Enköping Museum, Enköping, Sweden, that the researchers discovered that the woven bands contained ancient Arabic script, Kufic characters, invoking both Allah and Ali. The Kufic characters were found in the Viking Age in mosaics on burial monuments and mausoleums, primarily in Central Asia. Similar Kufic characters appear in the grave costumes in Viking Age chamber graves in central sites such as Birka in Mälardalen, as well as in boatgraves in the area around Gamla Uppsala. In her earlier research, Annika Larsson has emphasised the widespread occurrence of Eastern silk in Scandanavia’s Viking Age graves. In the Valsgärde boat graves, just north of the key Early Iron Age site Gamla Uppsala, findings of silk in the clothing of those buried are far greater than findings of wool and linen. Analyses of materials, weaving techniques and design suggest ancient Persian and Central Asian origin. Larsson’s research findings are presented as part of the Viking Couture exhibition at Enköping Museum. The project is funded by the Swedish Foundation for Humanities and Social Sciences, which is conducting a pilot project aimed at presenting new research in the form of exhibitions. The project uses research methods other than the usual theoretical, because the results are intended to reach a wider audience than just academics. Exhibitions are largely based on visual communication, and one method for this is recreation processes, such as that of the textile bands. The textile archaeological project group also includes textile master student, Karolina Pallin, who has recreated the woven bands for the exhibition. These findings are preliminary results of an ongoing study which will be peer reviewed and published at a later date. In an integrated sub-project, DNA analyses are performed on human remains from relevant graves, in collaboration with Professor Marie Allen and her research team at the Department of Immunology, Genetics and Pathology at Uppsala University. It is hoped that the sensitive DNA analysis methods will help provide answers to questions on kinship and geographic origin. The exhibition texts are also displayed in Arabic. Edited 19 & 20 October 2017 to clarify that these are preliminary results, to be presented as an exhibition. Heading and lead edited 27 October for clarity.